In 1533 the Yaqui Indians of Sonora repelled the slave raiding of the Spanish. 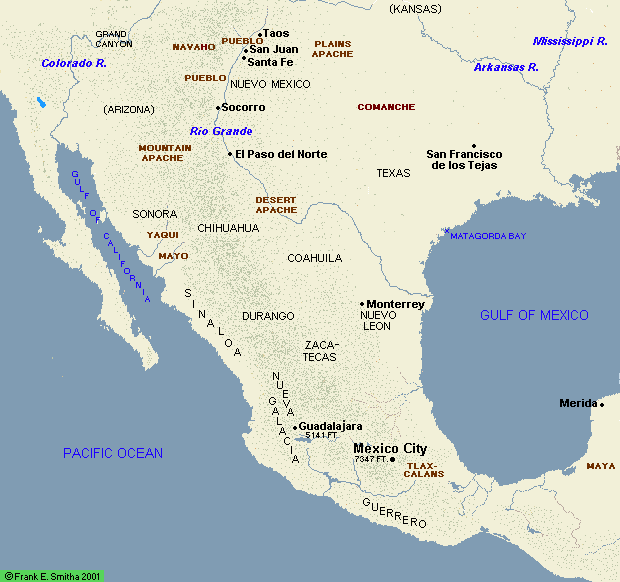 In 1565 they welcomed Spanish explorers who came in peace, the Yaqui showing them hospitality in hope of winning Spaniards as allies in the war they were planning against neighbors to the south – the Mayo Indians. The Spaniards had withdrawn, and other Spaniards had come decades later, also in peace. In 1587, the Spanish crown had given permission to Jesuit missionaries to work Mexico's northwestern frontier, and the Jesuits had arrived in Sonora in 1591, protected by soldiers. The Jesuits impressed the Yaqui with their good intentions and their spirituality. The Jesuits brought a message of everlasting life and won Yaqui confidence with their concern for their well-being. According to Jesuit missionaries, by 1606 they had converted 40,000 out of a population estimated to be 100,000. The Jesuits improved Yaqui political organization and integration, some Yaqui having been scattered and isolated on their individual agricultural plots. The Jesuits managed to make themselves into a ruling priesthood among the Yaqui, and as such they came into conflict with Spain's secular authorities, the Jesuits wanting to protect the Yaqui from exploitation by mine owners. Spanish authorities in Mexico became hostile towards the Jesuits, and in 1637 they lobbied the Spanish crown to secularize missions among the Indians, to "free" the Indians from mission controls. The Jesuits argued that exploitation would bring more Indian uprisings and that their authority over the Indians would keep the Indians peaceful. The Jesuits prevailed, but later in the century lucrative mines were developed in Sinaloa and Sonora, and the conflict between the Jesuits and secular authorities intensified. Mining interests accused the Jesuits of working the Indians as slaves, of inflicting harsh corporal punishments upon the Indians and of neglecting their spiritual commitments. Jesuits accused the miners of having something less than a benevolent regard for Indian welfare. Some mine owners had been using Indian slave labor. The monarchy's authorities had been ignoring the Spanish crown's declaration that enslaving Indians was illegal. The dispute between the Jesuits and secular authorities went to court, and the judgment was made that all Indians working in the mines had to be paid 2.5 reales per day, that Indians working the mines against their will had to be freed, and that the Jesuits had to free Indians under their control to work in the mines if they so desired. The Jesuits were criticized for working Indians without pay, this judgment not taking into consideration that the Jesuits were operating a communal society, where labor and food were not bought and sold. Communalism lost to free enterprise, and more Yaqui men, searching for wages, went to the mines.